The founders of our Covered Bridge Festival could have chosen to hold it any time of year, since the bridges are always there and picturesque in any weather, but they were inspired to choose fall, and I can see why. Wow! This was a beautiful display from Mother Nature last fall. When I was kid, most of the Covered Bridge Festival activity was on the square. At that time, many of us reveled in the annual freedom to roam around and spend our allowance money on hand-crafted knick-knacks and food. So much food! For the locals, the festival was a social event more than anything, and a very inviting one, beckoning to extended family members and welcoming many visitors to town for a taste of our collective hospitality and culture. 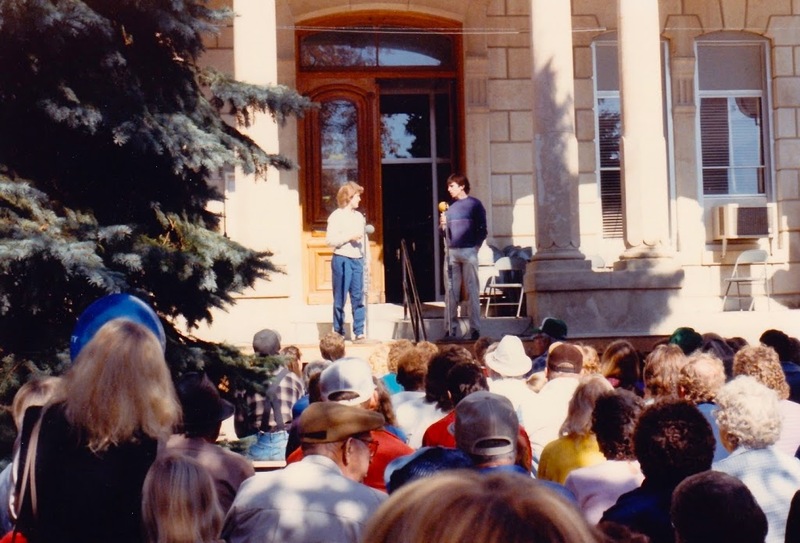 In 1985, I obliged Meredith Easter and sang selections from “The Sound of Music” on the courthouse steps. Today, the festival is a town-wide celebration, with activities commemorating our heritage still located on the square, as well as scattered around the area. These activities outside of the square help disperse the traffic, support local organizations, and provide entertainment options — most of which have an old-fashioned flair — to delight visitors and locals all weekend long. Most of the old favorite elements are still there and then some, if you know where to find them! (Not fresh cider, though — just Google “unpasteurized apple cider” and you’ll see why that’s a bad idea.) In this post I will share what I know about the events of this coming weekend based on information from the Chamber, plus some messages I have received. That being said, with all that’s going on, I will likely miss a thing or two from this lineup unintentionally. If you have an activity to add, please feel free to comment. I’ll get to the events that span Saturday and Sunday in a moment, but first, some special attention to time-specific events you won’t want to miss. Here we go! 13th Annual Covered Bridges of Madison County Antique Tractor Ride: Rides depart from the Madison County Fairgrounds at 8:30 a.m. on Friday and Saturday mornings. Friday’s ride will tour through five of the bridges and Clark Tower, and Saturday’s ride will highlight the hills and valleys of our scenic Madison County roads. There is a $25.00 entry fee for tractors, and a people-mover available for family members of tractor riders each day, as well as breakfast and lunch. Contact Curtis Saveraid (515-210-7806) or Jami Saveraid (515-210-7608) for more information. Radio Suspense Theatre: This is a live nostalgic radio play complete with music, set in 1940, performed at The Winterset Stage. There is one show on Friday night at 7:00, and two more shows on Saturday at 2:00 and 7:00. For the two evening performances, there is an optional dinner available before the show, at 6:00 each night. You can purchase tickets in advance at this link. Radio Suspense Theatre is directed by Patricia Nelson, with music direction by Carla Vasey. Jason Stanbro, Doug Darnall, Allison Engel, Bill Yount, Claire Terhaar, Annie Nielsen, Bob Rhodes, Roxanne Johnston, Julie Rodish-Reed, John Gambrall, Patricia Nelson, and Bluegrass Hall of Fame inductee Billy Dunbar star in the show. Covered Bridge Race, 4K/8K Run/Walk: Registration begins at 7:00 a.m. at the City Park, by Cutler-Donahoe Bridge. You can also register online at this link. There is a children’s event that starts at 8:00, and the 4K/8K begins at 8:15. It is sponsored by the Winterset Rotary Club, with proceeds benefitting the Winterset Park Maze Project. Fall Hunter Education Course: Not part of the festival activities, but it is happening, so I don’t want to leave it out! The Madison County Conservation Board is providing an independent, internet-based hunter education course from 8:00 to noon, designed for students age 12 and up that have schedule conflicts and are unable to attend a traditional class. To register in advance, check the information in the Old Oaks Journal for Fall, page 3, or contact Steve Pearson at 462-3536 or spearson@madisoncountyparks.org. Annual Horseshoe Tournament: Registration and warm-up is from 8:30 – 9:30 a.m. at the Madison County Fairgrounds. There is a $10.00 registration fee, and sanctioned and unsanctioned members are welcome. For more information, contact the Winterset Parks & Recreation Department at 515-462-3258. Dream Big Dreams Mural Project Dedication Ceremony: The public is invited to attend the official “Dream Big Dreams” Mural Dedication at 9:30 a.m. on Saturday at the George Washington Carver Memorial Park. This wonderful community art collaboration has been a year-long work in progress, and many area children and dedicated volunteers will finally be able to see their work on display. Library Rocks: The library is participating in the city-wide collaboration of family-oriented activities on festival weekend called the Timeless Treasure Hunt. They will have a tent in Monumental Park and will be identifying rocks, making crafts with rocks, and doing a treasure hunt for timeless treasures that are important to the history of Winterset and Madison County. Activities begin at 10:00 and are free to all. Remember, this is on Saturday only! United Methodist Church Luncheon: The Methodist church, at 309 E. Jefferson, will start serving chicken and noodles at 11:00 a.m. and probably go until they run out. The cost is $8.00 for adults and $4.00 for children. Alumni Welcome Reception: All Winterset alumni are invited to stop by the Farmers & Merchants State Bank Hospitality Room for a reception from 1:00 to 4:00. All Class Reunion: The annual WHS All-Class Reunion will be held at the Jackson Building (a switch in location from previous years) from 5:00 to 9:00. Jo Agan will provide the food, and the Alumni Association Board will provide beverages. A donation will be accepted to help offset costs to the Association. This is a great opportunity to see old friends and renew your membership (or start a new one). Loynachans Homecoming Gospel Sing: This is the 13th annual gospel-sing event for The Loynachans held at New Bridge Church, 1305 W. Jefferson Street, from 5:30 to 9:00. The public is welcome. For more information, contact Jack at 515-468-8259. 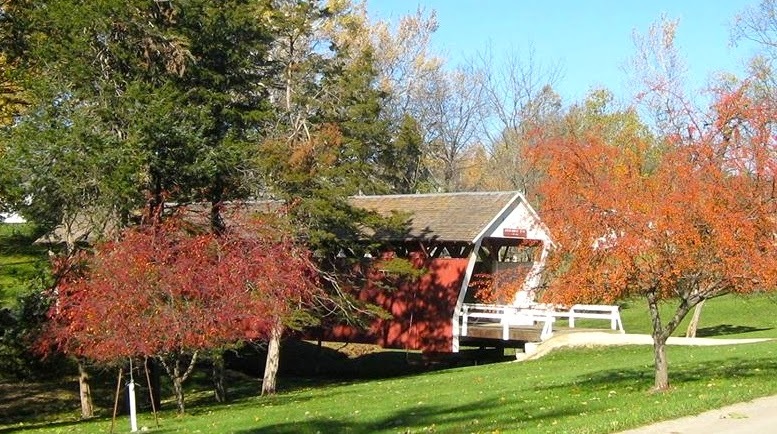 Meet Me at the Bridge: From 6:00 to 10:00 p.m., the public is invited to meet at the north shelter in Winterset City Park for wine tasting by Covered Bridges Winery, with a pork loin sandwich meal available, live music by Exit 113, and a live and silent auction. Attendance is free, and the meal is $10.00. (just west of the Fire Station), to commemorate Carver’s 150th birthday in 2014. 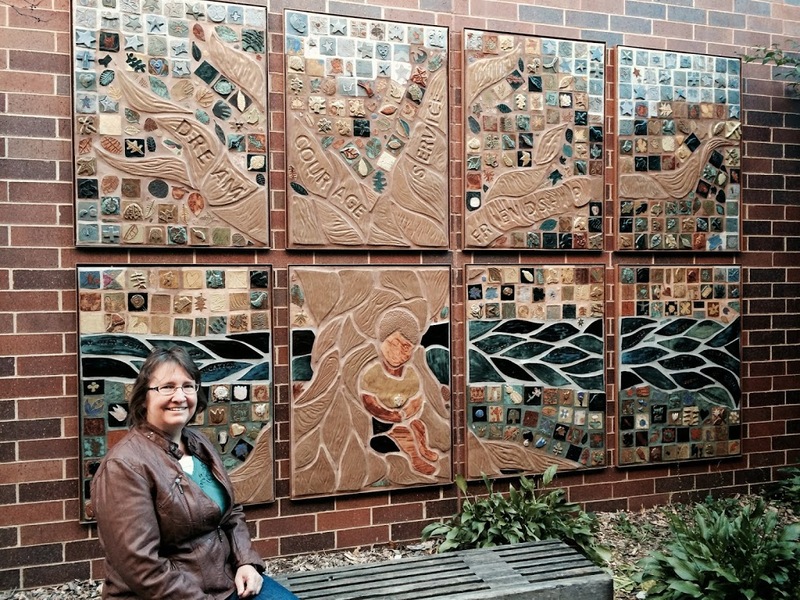 Join Carol Leichty and the project’s full committee and volunteers at the dedication ceremony at 9:30 on Saturday. Madison County Car Show: Hosted by the Central Iowa Auto Club, the annual car show will take entries from 8:00 a.m. to noon on Sunday, with a $15.00 fee at the gate. Like last year, the show will be held at the football field by the old Middle School building between 1st and 2nd Avenue. Awards will be at 3:30. Contact Terry Housman with questions, at 515-462-4648. Antique Vehicle and Covered Bridge Festival Parade: The big parade begins at 2:00, departing from Winterset High School, with former superintendent Ken Bassett as this year’s parade marshall. ** Note: The Madison County Two-Mile Run that was scheduled for Sunday before the parade has been canceled, according to Bob Kaldenberg. 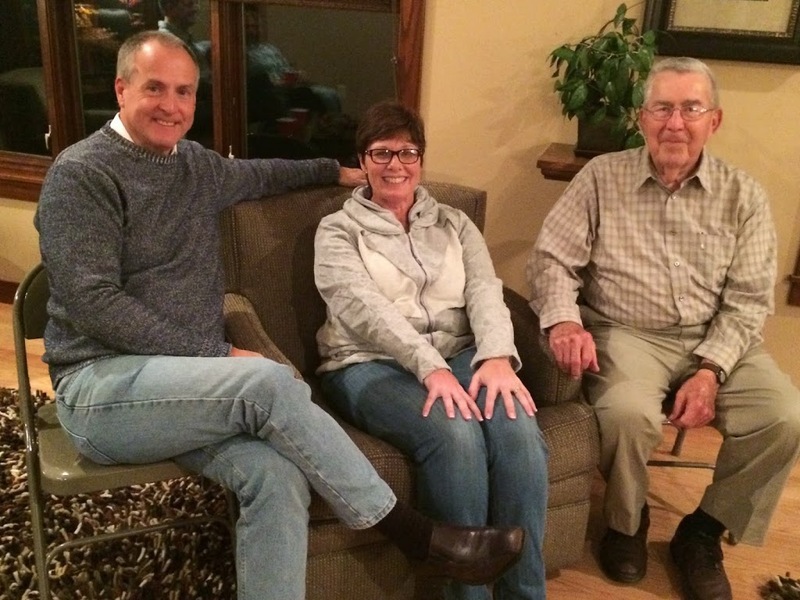 Dr. Doyle Scott, Dr. Susie Meade, and Mr. Ken Bassett. Firefighters’ Pancake Breakfast: Start your day with a hearty breakfast at the Winterset fire station, at 124 W. Court Ave., from 6:00 to 11:00 a.m. both days. The Farmers’ Market: This will be located on the southwest side of the square (1st Avenue). The Timeless Treasure Hunt/MCFEE Booth: Look for this tent located on the east side. There you can take a “selfie” with famous citizens from Madison County, enjoy a walking tour of historic buildings on the square, and play a matching game to learn more about the people of Madison County, our timeless treasures. Activities are free for youth, and prizes for participation are awarded. It is sponsored by the Madison County Chamber and the Madison County Historic Preservation Commission. Pioneer Village: This is located on the courthouse square with live demonstrations of crafts from the turn of the century, such as spinning, weaving, jewelry making, woodcarving, pottery, chair caning, and more. Courthouse Tours: Meet Susan B. Anthony at the north courthouse door at 10:00, 12:00, or 4:00 p.m. both days, sponsored by the Madison County Historical Society. Winterset P.A.W.S. Display: See the display of “Timeless Treasures” at 124 N. 1st Avenue on the square, the former Lowe’s Chiropractic office. These items were made from recycled materials by district elementary and middle school students involved in the P.A.W.S. after school program. Passport to the Past at Madison County Historical Complex: Field mercantile, penny candy sales, free horse and wagon rides, Tusha School old-fashioned school lessons, Civil War encampment with battles, Bevington-Kaser Mansion and Madison County Historical Museum tours, with free admission from 9:00 to 5:00 on Saturday and Sunday. Civil War Cannon Firing: You have several opportunities to experience the firing of the Civil War Cannon at the Madison County Historical Complex this weekend, at 4:00 p.m. on Saturday, a special nighttime firing at 7:15 p.m. on Saturday, and again at noon on Sunday. 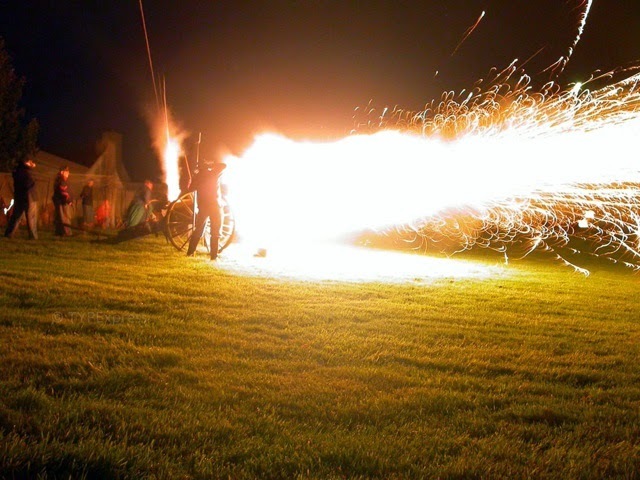 The nighttime firing on Saturday will include s’mores (starting at 6:45) and a bonfire — just bring lawn chairs or a blanket and enjoy the family fun. Covered Bridge Bus Tours: The Rotary Club offers daily tours with a guide, starting at the old Winterset Middle School (or the old high school, depending on your age! ), departing every half hour from 10:00 to 4:00 for $8.00 per person. The tour will include four of the bridges. Horse and Carriage Rides: These will be available in the City Park by Dream Carriage, for $5.00 per rider. John Wayne Birthplace and Trail: Tours of the birthplace are available from 9:00 to 5:00 both days, and there’s a brand new John Wayne Birthplace Trail, touring through Madison County to view historic locations in the life of John Wayne. More on this new project in an upcoming post! Maps of the trail are available at the birthplace, the Chamber, and the Historical Complex. Bras for the Cause: Cast your vote at the former American State Bank building, 113 S. John Wayne Drive, for your favorite bra creation by purchasing tickets for $1.00 each. All proceeds stay with Bras for the Cause to fund cancer screening for Madison County residents. Master Gardeners: At Carver Park, there will be demonstrations and lessons based on the life and work of George Washington Carver. Explore cotton plants, make peanut butter, and enjoy the new mural (to be dedicated on Saturday). Look for the gardeners there from 9:00 to 5:00, Saturday and Sunday. Winterset Art Center: Also from 9:00 to 5:00 on both days, the Art Center activities will include an art exhibition and sale, crafts for children, a 150th birthday party for George Washington Carver, and lunch for $5.00. Quilt Show: Held at Winterset Elementary gym, the quilt show includes a large display of locally made quilts, vendors and demonstrators, and a raffle. Hours are 9:00 to 5:00 on Saturday and 10:00 to 4:00 on Sunday, with a $3.00 admission. photographed by Wayne Davis of TYPExpress. See it again on Saturday at 7:15 p.m.! 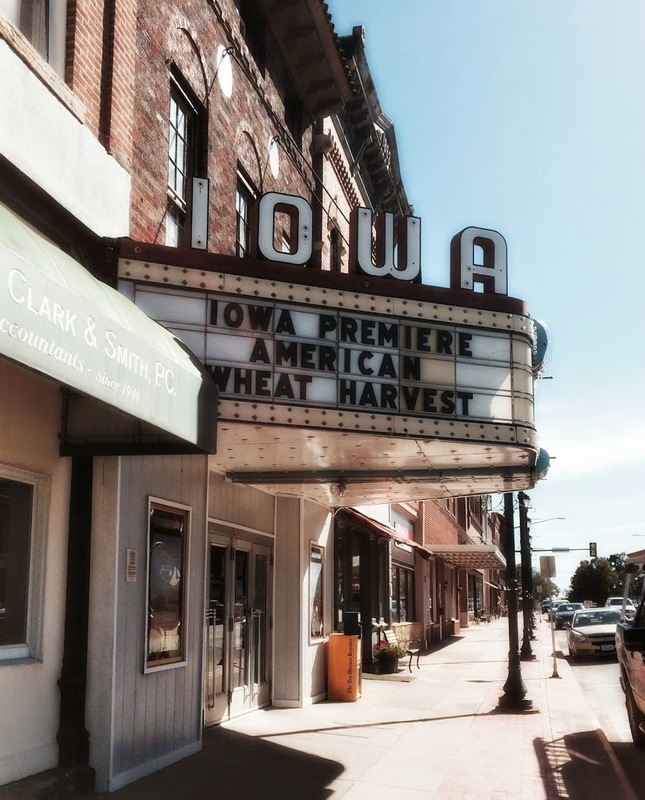 Finally, there’s a special event happening at the Iowa Theater this weekend, the Iowa premier of the film documentary “Great American Wheat Harvest,” a salute to the hard-working Midwest farmers who feed the world. You can catch a show on Friday at 7:00, Saturday at 1:00, 4:00, and 7:00, and Sunday at 12:30. See the film trailer and more information at this link. That is all for now! Thank you to the Covered Bridge Festival committee for their planning and preparation for this weekend, and thank you for reading The Winterset Citizen. You can subscribe to receive updates by e-mail at this link. Just look at this beautiful forecast! Have a great weekend in Winterset.